Performance Time: Approximately 90-120 minutes, 71 pgs. 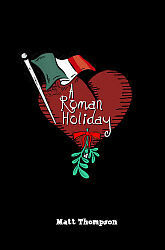 HOLIDAY/ROMANTIC COMEDY. It’s a Christmas of mischief, mayhem, and meatballs in this hilarious romantic comedy. When Stacey arrives in Rome to rendezvous with her boyfriend, Michael, she unexpectedly encounters Nigel, a British professor and kleptomaniac; members of the lively, animated Pagliazzi family; and an Italian don dressed in a Santa suit and sunglasses. When Michael arrives at Stacey’s hotel and proposes marriage, Stacey panics. Suffering from a bad case of pre-marriage jitters, Stacey concocts a plan to make Michael jealous by having Nigel pose as her boyfriend. But Stacey’s plan goes awry when Nigel dons a dress and introduces himself as a German chef named Belinda Bratwurst. Twists, turns, and misunderstandings abound in this face-paced comedy that features endless opportunities for actors to showcase their comedic talents. Matt Thompson is an actor and an award-winning playwright who has published several plays. Formerly the director of Compass Theatre in San Diego, CA, Mr. Thompson now serves as the theatre school director of education at North Coast Repertory Theatre in Solana Beach, CA.